AstroPay is the fastest growing online payment services provider in Latin America offering both consumer and corporate payment solutions. Based in the UK, AstroPay is popular mostly for its virtual prepaid cards, which can be used multiple times for making fast, secure and completely anonymous payments on the Internet. Operating in select countries across Central and South America, AstroPay is among the top issuers of virtual prepaid cards in the region. It is rapidly growing as an online payment method in countries such as Brazil, Argentina, Mexico, Costa Rica, and Chile because it provides users with reliability and high levels of security. Countries used in Different countries in Latin America and Asia. Purchasing Astropay card The fee you might pay depends on the payment method you are using. The AstroPay Card is a virtual, disposable prepaid card that works almost like a credit/ debit card with a few small, yet crucial exceptions – the amount of money stored in it is fixed, it provides complete anonymity, and the risk of stolen personal or banking information is minimal. In addition, users can pay in their local currencies when purchasing the AstroPay Card, while all transactions are conducted in US dollars. Although traditionally, prepaid cards are not the most popular payment method for online gambling, AstroPay is becoming one of the most preferred solutions by Latin American casino players. It is well integrated not only in thousands of web-based stores but also in a large number of online casinos. Players use it to make safe and fast deposits into their casino balances without having any concerns that they may reveal some sensitive information on the Internet. AstroPay offers users prepaid virtual cards which cannot be reloaded after the funds in them are spent. They function like credit or debit cards when making payments on various websites – the user selects AstroPay as a payment method and enters the card data to authorize the transaction. However, during this process no personal or banking information is entered, so the payment remains anonymous. The AstroPay Card can be used for making purchases, paying bills and casino deposits multiple times. It is offered in denominations ranging from $25 to $500, but to purchase it, users need to register at the official website of the service. While the card supports only one currency – US dollars, it can be bought using a local payment method and over 10 different currencies. 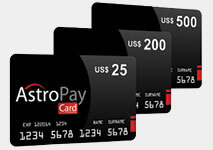 Card holders may own several AstroPay Cards, with the exact number depending on the country they reside in. Currently, the countries where AstroPay Cards are available include Brazil, Argentina, Peru, Mexico, Uruguay, Costa Rica, Bolivia, Chile, Colombia and Venezuela, as well as Japan, China, Indonesia, Greece, and Turkey. The virtual cards are valid 12 months after purchase or after the card balance is used. Opening an account at the AstroPay website is necessary for obtaining an AstroPay Card. Registration is free of charge, as well as rather easy and straightforward, and only some basic personal information needs to be provided – a full name, a valid ID (CPF, ID, Certificate of Citizenship), and a date of birth. You also need to enter your e-mail address, so that AstroPay can send you a link where you will confirm your account. Once the registration is complete, you need to choose the value of the card you want to purchase – $25, $50, $75, $100, $200, or $500, as well as the payment method. Various local options are available here – bank transfers, credit cards, cash deposits, prepaid PINs, or direct debits. You can pay in your local currency, too. There are no additional fees and costs for the card. When you confirm the payment, you will receive your AstroPay Card details by email. Typically, AstroPay Cards are received within minutes, but with certain payment options it may take up to 3 business days. The service will send you the 16-digit card number of the virtual prepaid card, as well as a 3-digit CVV security code – just like with credit and debit cards. Making a deposit into online casinos via a prepaid virtual AstroPay Card is instantaneous and resembles depositing through a credit/ debit card. AstroPay or AstroPay Card needs to be selected as a deposit option at the casino’s Cashier section. Then, the system will ask you to fill in a certain deposit amount, as well as the card number, the CVV code and the expiration date of the card. Most web-based gambling providers do not charge fees for deposits via AstroPay Cards. The service itself also imposes no fees for transfers. On the other hand, many casinos will reward players with reload bonuses for each deposit. You will see the deposited funds appear in your online casino balance immediately after confirming the transaction. Gambling enthusiasts who plan to make deposits through AstroPay will need a different method for cashing out as the service has no mechanism for withdrawing funds to the prepaid card. Popular alternatives are bank transfers, e-wallets or credit cards. The prepaid virtual AstroPay Cards are free of any fees, which is one of the reasons for their popularity among casino players in Latin America. This is not a reloadable prepaid card, but users are allowed to own several cards, which can be merged. To be more precise, their monetary values can be merged. Customer support needs to be contacted with a request for merging the card balances and usually, a confirmation email is received within a few hours. Deposit limits vary between different casinos, but typically players can top up a minimum of $10, while the maximum limit depends on the VIP status of the player. Prepaid cards, including the virtual AstroPay Cards, are the ideal solution for casino players who do not wish to disclose any personal or banking data to gambling merchants. When depositing or making any type of payments using AstroPay Cards, players enter only the number and the expiration date of the card, as well as the CVV security code – no names, credit card or banking information is filled. The website of AstroPay is exceptionally secure and protected via TLS encryption, so the risk of stealing your card details is minimal. In case this does happen, however, stealing any credit card or banking account data will be impossible. The high levels of protection and security of AstroPay Cards make them one of the most preferred deposit methods by players residing in Central and South America, China, Thailand, and Turkey. The payment method is being adopted by more and more web-based gambling operators and it can also be used at hundreds of online shops. Another great advantage of AstroPay over other deposit options is that the amount of funds that can be spent is predetermined, so you cannot spend money that you do not own – as it is with credit cards, for instance. The service does not charge any extra fees, which is beneficial for anyone who decides to use it. And all payments remain totally anonymous – an important factor for many gamblers when choosing a payment service. 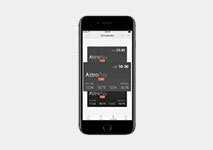 Also, AstroPay Cards can be purchased in several local currencies, using local banking methods. Unfortunately, as a prepaid type of card, AstroPay lacks the option for withdrawals. Players who make deposits via its virtual cards will need to consider using an alternative payment method to retrieve the winnings from their online casino balances. Another disadvantage of this platform is undeniably the fact that it is available only to residents of several Latin American and Asian countries. Despite the fact that AstroPay Cards were designed as a regional payment solution in markets where traditional methods are not present, the service is already extending beyond Central and South America. This payment option offers fast, secure and anonymous casino deposits, as well as a convenient tool for controlling your spending on the Internet. It comes with no additional or hidden fees, which is yet another reason for its popularity.